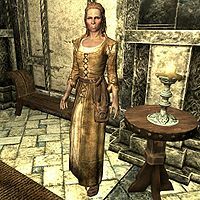 Una is a Nord citizen working as a servant and housekeeper at the Blue Palace in Solitude. Like her colleague Erdi, she sleeps in the servant quarters behind the kitchen every night from midnight to 8am and spends the first three hours of the day eating breakfast or strolling around. At 11am, her routine depends on the quest Tending the Flames; if you have yet to complete the quest, she will head upstairs and find a bench and relax for seven hours. If the quest is completed she will leave the palace at 11am and spend two hours in the courtyard outside the Bards College before returning to the palace and her bench. At 6pm she spends three hours leaning against the woodworks outside Angeline's Aromatics until she heads back to the palace and goes to bed. She wears cheap clothing, a belted tunic with boots. She carries a spare belted tunic and an assortment of lower-class items and gold. Although she never lifts a finger in the castle, she will be quick to tell you: "Watch your feet. We just cleaned there!" and "Got lots of things to take care of. What do you need?" During the quest The Mind of Madness you will have to find a way into the sealed-off Pelagius Wing of the Blue Palace. When you ask Una about access she will say: "Not on your life. It's dangerous in there, and Falk doesn't even like me and Erdi going in every year to clean out the spiders." Tell her that Falk Firebeard sent you and she will change her mind: "If you really want to... Just be careful of the ghost! He snuck up on me once and scared me sick. It took a week for me to feel better..." She will then hand you the key and bid you farewell with: "I guess I should be getting back to work. It was more fun talking, though." This page was last modified on 20 March 2013, at 05:19.